Lowe's Dishes On Hammers Can The Shack Unscrew Its Image? I like to make furniture of all kinds. 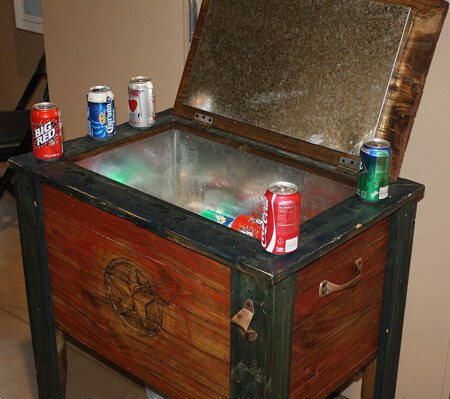 From tables to cribs, it doesn’t matter, but when I saw this end table/chest/beer cooler at a social event recently, I knew it made the list of crap I gotta eventually build. It’s not just that it’s a table and cooler, but the construction of the design also makes me think this would be a great project to tackle. It’s rough and simple but provides a lot of areas to customize. Now all I need to do is find an old metal cooler and build an end table around it. Normally I don’t go for the rustic stuff, but in this case I’ll make an exception. Seems like a worthy project to me. I think I wouldn’t wait for the old metal cooler, and take some 2″ – 3″ rigid foam and sheet copper (flashing?) and make my own cooler. That and a 4″ x 4″ fresh off a jointer for a home made brake. I’m with Joe, don’t wait to find the perfect interior. Make it! Aluminum flashing would also work, and I would make sure to put a drain line in to get the melted ice out of there without having to tip the whole thing. Using some expanding foam to get in around the nooks and crannies might also work. I think I’ll have to add it to my list as well. @Joe dude! great idea! I’ll have to try that. There’s a place down in Houston that sells a version of this, the Tool Club out on Harwin. If this is the first time you’ve seen one I’m kind of surprised. I think I’ve seen Kroger sell one during the beginning of summer. Great choice for a remake though. I’ll take my with a galvanized pail n spigot and just have fun filling it with ice. Wonder how hard it’d be to build it with a hinged front or side that kept a good seal when closed. That way I wouldn’t have to move the stuff that would inevitably be on the top out of the way to get a fresh cold one.